The Travels Of Le Randonneur: First Impressions Of The Yamaha EC-03. 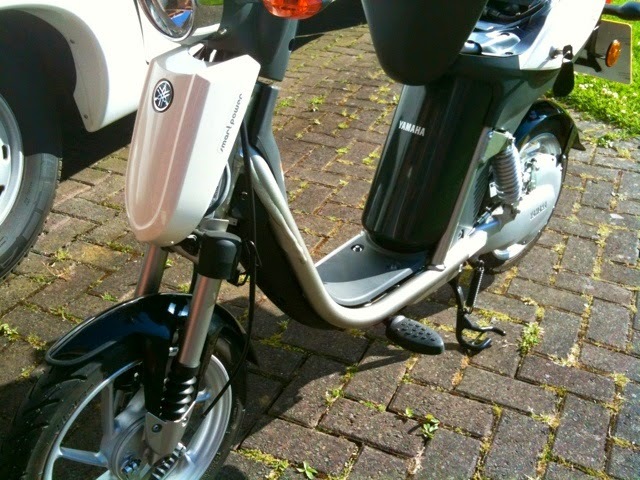 Today I collected my Yamaha EC-03 electric moped from ESB Mototorcycles. We intend to use this solely as a satellite vehicle from the motorhome. I had told the dealer on Saturday that I would bring the motorhome along to use it to transport the bike home, but as it was such a lovely day I asked a friend to drop me off so I could ride it home. Unfortunately, they were not expecting that, and as I arrived at 10 am it was not fully charged, showing only 4 out of 5 bars on the battery indicator. Not an issue though, as home was only 5 miles away - and it wasn't, I covered 11 miles in total enjoying the ride home the long way round, and the indicator still showed 1 bar at the end of it. So - that aspect appears to be acceptable, as my weight also equates to the little bike's maximum total weight capability. I am pleased with that, as it was one of my main concerns. Yamaha use a petite Japanese girl in all their promotional videos. As can be seen from the images, the bike has a very small physical size, and at only 56 kg, is very easy to lift in and out of a vehicle, or boat for that matter. 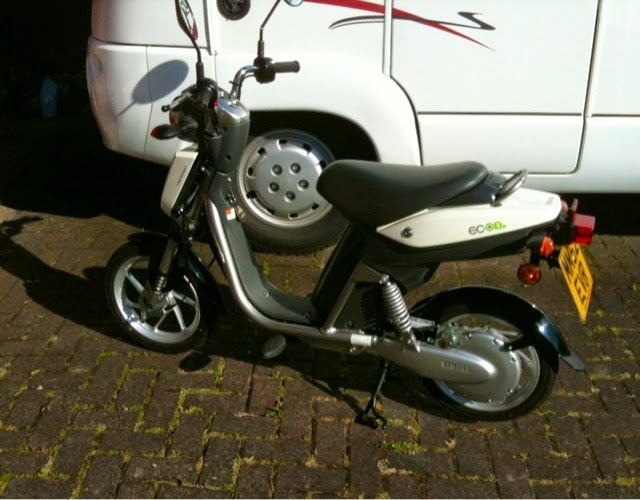 It is also much slimmer than the average petrol driven 50 cc scooter, so takes up much less space in storage. There is a bag hook provided in front of the saddle, but I already own a piece of soft Oxford Luggage that will fit very nicely between the footrests. Margaret has now had her very first ride on any motorised two wheeler. She is able to drive this on her car license without L plates or any further training (other than the personal CBT training that I gave her). This is subject to the date you passed your car driving test in the UK. Those who passed theirs post the relevant date, (1998 I think - check on the uk.gov website), do require CBT and also to display L plates, as their license only acts as a provisional for a moped. This is the combined Yamaha drive unit and motor. 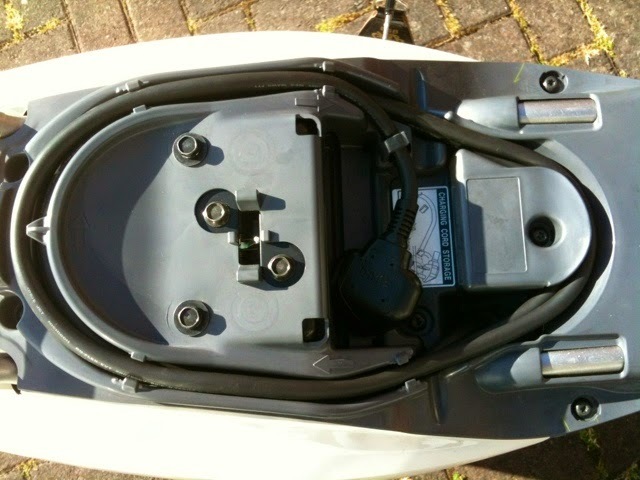 The Sanyo 48V 15ah lithium-ion battery is stored vertically below the seat. It has a claimed 8 year or 9000 re-charge lifespan. Being lithium-ion, the battery can be charged before all capacity has been used up without any "memory" issues that may reduce its capacity. The bike is also fitted with a safety cut-off that won't allow complete discharge of the battery, which would terminally damage it. Careful planning is therefore required to reduce the possibility of having to push the bike home! Under the saddle we have a helmet attachment cord for when you want to leave the bike and shop without it hindering you. 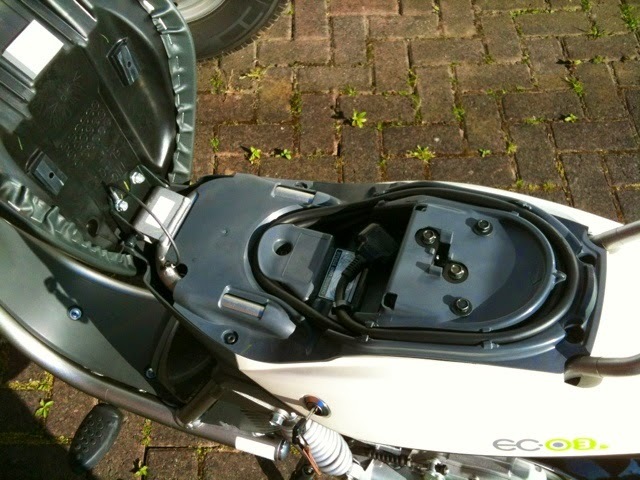 This is also where the charging cable is stored, with a standard domestic earthed 3-pin plug fitted for the UK model. This makes it easy and convenient to charge at home or at work, but bars you from using the public charging posts that are currently appearing on car parks all over the country. For example, to sign up and use the Greater Manchester Electric Vehicle Charging Scheme, (TFGM - EV), the standard domestic plug would need to be replaced by a type 2 plug which is their standardised connector. There are two accessories available to the UK buyer - a rear carrier rack and a front basket. Both are expensive at around £164 each - so I won't be buying. Although it has to be remembered that this is still a low production volume item, which affects the costs of everything associated with it, including its own price. Below is the information centre. The "ignition switch" is just below on the vertical stem. The LCD display provides all the information that may be required - what power mode is selected, battery level, speed, odometer and trip meter and all other warning symbols that might arise. 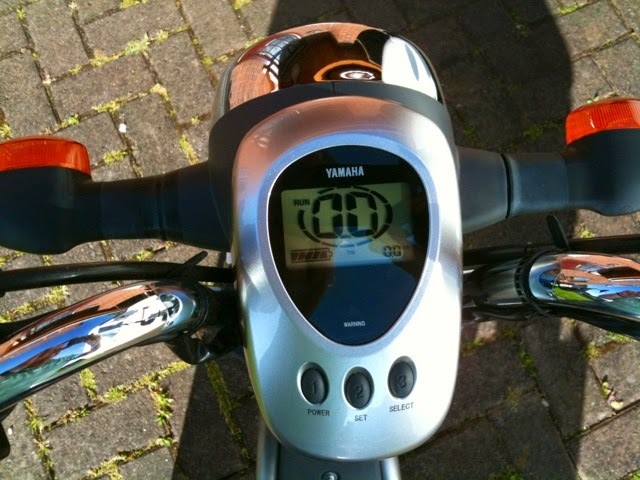 The bike also has audible warning beeps, including one that continues when the bike is stationary but in "RUN" mode. As the key is turned on the bike goes into stand-by mode, with just the battery indicator and the word "PUSH" flashing on the right. Any of the three buttons can be used to place the bike in the RUN mode. In standard power mode the bike carried me at around 18 - 20 mph on my ride today. When POWER mode is selected, for an extra boost on inclines or in traffic, using button 1, speed rises to a maximum of 28 mph, but with a reduced range if used permanently. Being an electric vehicle it also has a "punchy" launch from standstill, something that its petrol powered counterparts are severely lacking in, particularly the restricted 4-strokes. The bike has the usual motorcycle key steering lock, but also has a clever "PIN number" facility which can be set by the user to provide an extra layer of security, in the same way as a mobile 'phone, although anyone with a van could have it away quicker than you could say "STOP THIEF"! The lights are in operation permanently, and I have now considered replacing the bulbs with LED's, something I thought Yamaha might have considered, although having researched them, the 35 watt H4 fitting halogen headlight doesn't appear to have an equivalent LED that has type approval for use on roads - yet. Once at home I placed the bike on charge at mid-day, and the charger automatically cut off, fully charged at 4.30 pm. 6-7 hours is claimed as the charge time from completely flat. The EC-03 is classed as a 50 cc petrol moped in the UK, so has to be insured and a motorcycle helmet has to be worn. The vehicle excise duty is free, and from the 1st October 2014, as with all vehicles, a paper tax disc will no longer be required. It is also exempt-able from the London Congestion Charge. As I described in my previous posting, depending on your own driving license circumstances, it could be driven without L plates or CBT if you hold the relevant full car license. All in all, so far so good, and I believe it will suit our purposes well. Below is a French video of the bike in use. I chose this one as it has the best sequences of the bike in use around town. 11th July performance update. 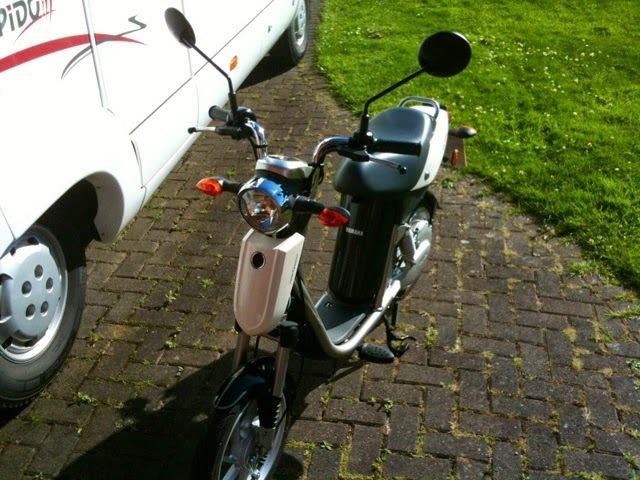 The performance of this little electric scooter used in its "power" mode is exactly the same as any small 50cc 4-stroke petrol moped, giving adequate launch acceleration and speeds up to 30mph, although a warning light and beeper comes on at 28mph, which is approaching the UK legislative maximum speed for a moped. Used in this mode it is a breeze to use around town. Bearing in mind my own weight is right at the maximum recommended payload for the bike I have achieved a range of 12 miles from full charge down to 1 bar remaining on the battery indicator over a 2 week period of use without re-charging. The battery would also discharge naturally by a small amount while sat in the garage. Using the bike in "normal" mode, the speed, under my weight, is no more than 15mph - 18mph depending on road conditions. This makes its performance more in line with a pedal cycle, but of course you don't have to pedal. Range should also be considerably increased in this mode, although I have yet to fully test that, as using in power mode is so enjoyable. I would conclude that to obtain the best all round performance a mixture of the two power modes should be used by the rider depending on road and traffic conditions. This can be changed at the touch of a button on the headlamp console. Overall I am still impressed by this machine for the particular use we bought it for, which is to make local shopping trips from wherever we might pitch our motorhome. Are the batteries dis-mountable enabling one to carry a spare. What is the battery weight. Many EV charging stations in the UK will take a 3 pin plugbut the amperage offered may be too high. I run a Nissan Leaf, it's great! Unfortunately the battery is built in and fixed. In my opinion a design failing. Hi Neil. I bought the ec-03 purely as a vehicle to visit shops etc while using the motorhome, and it serves that purpose very well. Although it has a very light weight and is extremely easy to load and unload from the motorhome, it does have its limitations. First it takes 7 hours to fully recharge from a flat battery, and at most I can only achieve 20 miles from a single charge. The bike has two power levels - the 1st with a maximum speed of only 17mph, the 2nd with a speed of 29mph. I prefer to use the high power setting, but that limits the range to around 12-15 miles only. Next, the bike is restricted to single seat, no passenger. The bike however is of very good build quality. 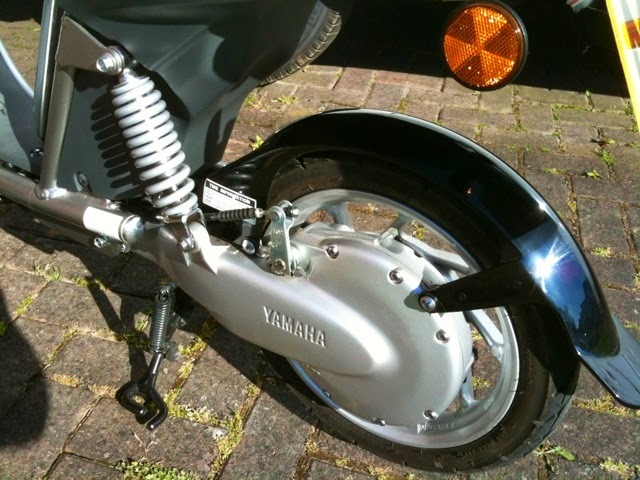 Having used it with the motorhome, I decided to buy a new Yamaha D'elight 115cc petrol scooter, which can carry two up and has a range of around 150 miles per tank of fuel. This was much more useful for a long term trip to Spain, but it is much heavier and harder to load and unload from the motorhome. As such, I have kept both, and depending on the trip we are undertaking, I load either the ec-03 or the D'elight, one to be used for shopping trips only, the other can be used for touring too. Thanks for a great write up! Its great to hear your experiences of the EC-03. I'm actually off to look at one tomorrow! does the bike need to M.O.T'd and does it need servicing? In the U.K. this is classed as a 50cc moped so requires road tax (free), insurance and MOT. Servicing is simply making sure brakes and bearings are OK. The Exploration Vehicle Has Been Acquired. What Type Of MOT Test Does My Motorhome Require? A Few Days In Anglesey.